CityMD, the leading urgent care provider in the New York Metro Area, is one of our first customers in healthcare. We suggested they submit their intranet project to Intra.NET Reloaded 2018, to great success! Founded in 2010 by a passionate group of emergency medicine physicians, CityMD‘s mission is to provide an exceptional experience through high-quality medical care and convenient access. Over one hundred companies entered into this competition, including some other LumApps customers. On April 23rd, at the Official Award Ceremony in Boston, 3 finalists were announced – Marriott, LumApps’ client CityMD and Norton Rose Fulbright. After an exciting live vote, CityMD came in 2nd place, with only 2 votes shy of beating Marriott for 1st place! 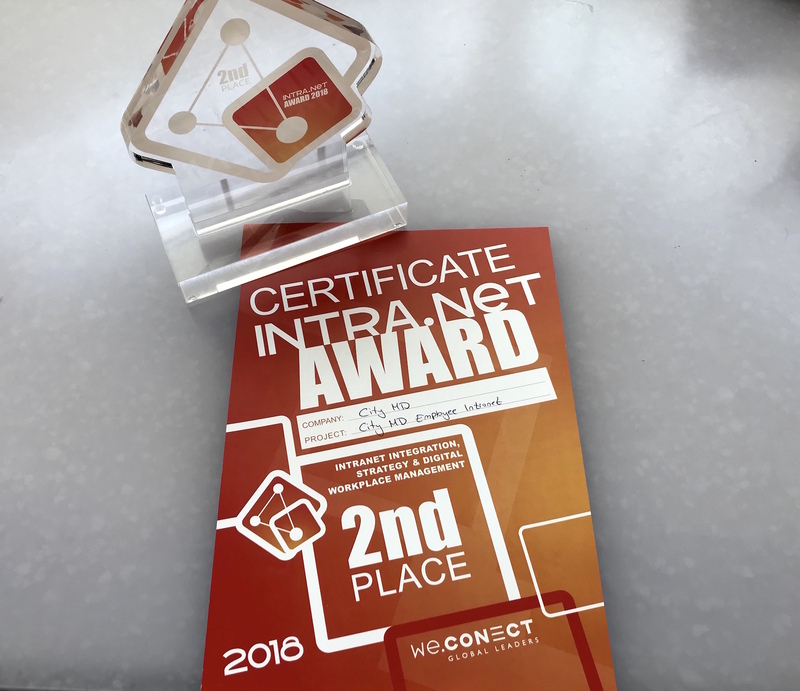 Presented by we.CONECT, the prestigious Intra.NET Award exclusively recognizes, celebrates and honors exceptional projects for Intranet Integration, Strategy & Digital Workplace Management. On behalf of CityMD, we.CONECT will exclusively donate $1,000 to DKMS, an international nonprofit organization dedicated to the fight against blood cancer and blood disorders. CityMD was thrilled to have won this award, and acknowledged that they couldn’t have done it without LumApps. Wondering how they won 2nd place? Here’s a bit about CityMD’s ambitious intranet project with LumApps. The CityMD intranet project was started in late 2017 and launched in under 6 months. It’s a convenient, comprehensive one-stop shop and the go-to resource for 2,200 team members at nearly 90 locations. As the centralized information hub for CityMD, it’s an invaluable and powerful streamlined communication tool for the whole organization. With Google as their backbone, they needed a platform that could deeply integrate with Google tools. LumApps is fully integrated with G Suite, which is the perfect fit to streamline user management, content visibility and document management, using existing Google accounts and groups. The CityMD intranet has drastically improved internal communications by centralizing all information in one place, thereby reducing broadcast emails, along with employee confusion, miscommunications and delays.